A SysCAD project consists of a number of independent process units, known as models, connected by pipes or links. Each model is documented independently and can be accessed from the following tables, or alternately, directly from SysCAD. These models are used in most projects. They generally form the backbone of the project. All models are available with a standard license. Feeder-Cross Page Connector A source or sink of material, or it can be used to connect streams on different flowsheets. Tie The tie can be used to join two or more streams, or to split a stream into a number of streams. It may have up to 20 inputs and 20 outputs. It may also contain reactions, makeups, vapour-liquid equilibrium (VLE) and/or general splitter (GM) sub-models. Pipe Pipe or material transfer model used to connect units. Tank A multi-purpose unit. Can contain reactions, heat exchanger, makeups or general splitter (GM) sub-models. Pipe - Dynamic Pipe or material transfer model used to connect units in Dynamic Transfer mode. This may include flow restrictions. Tank - Dynamic A storage unit for material in Dynamic Transfer mode. Can contain reactions, heat exchanger, makeups, etc sub-models. These models are used to transfer energy, or heat, from one stream to another. This may involve mass and energy transfer, or it may only involve energy transfer. All models are available with a Steady State or Dynamic license except for the Flash Train functionality which is only available in Steady State. All models require the Energy Balance add-on and some require an additional add-on as shown in the table below. Barometric Condenser Achieves vapour liquid equilibrium between an incoming liquor stream and a vapour stream at a user-defined pressure. Can be used as part of a Flash Train. Boiler This is a simple steam boiler. Boiler Feed Water is first heat to the required Drum Pressure then superheated to the required outlet pressure and temperature. The unit will produce steam and blowdown streams and predict the energy required by the boiler, based on the drum pressure and superheated steam conditions. Cooling Tower This is a simple water evaporation model where water is evaporated to provide cooling. Desuperheater This is a simple steam desuperheater model where water is added to reduce the degree of superheat in steam. Can be used in steam line in a Flash Train. Direct Contact Heater This is a very simple Model. Achieves vapour liquid equilibrium between incoming liquor and steam streams. Can be used as part of a Flash Train. Direct Contact Heater 2 Improved Direct Contact Heater model with more options. Achieves vapour liquid equilibrium between incoming liquor and steam streams. Can be used as part of a Flash Train. Evaporator (Crystallizer) Achieves vapour liquid equilibrium for a defined set of conditions and allows the user to enable Reactions and/or Solubility to produce crystals or a precipitate. Can be used as part of a Flash Train. Falling Film Evaporator In a falling film evaporator, weak liquor is pumped to the top of the unit and distributed to the tubes where it runs down as a film. Steam is entered on the shell side, the condensation of the steam provides energy to heat and if hot enough, evaporate water from the weak liquor, thus concentrating the liquor stream. Falling Film Evaporator 2 This has been superceded by the FFE4 model, which has additional functionality and ease of use. Falling Film Evaporator 4 In a falling film evaporator, weak liquor is pumped to the top of the unit and distributed to the tubes where it runs down as a film. Steam is entered on the shell side, the condensation of the steam provides energy to heat and if hot enough, evaporate water from the weak liquor, thus concentrating the liquor stream. This is a replacement for the FFE2 model, with additional functionality of being able to connect the model to other flash train components or evaporators without having to implement pressure controllers. Flash Tank Achieves vapour liquid equilibrium of the feed stream at a user-defined pressure. Can be used as part of a Flash Train. Flash Tank 2 As for Flash Tank above, but also allows the user to add Reactions and Solubility to the unit and allows the user to enable or disable the Flash Train functionality in the unit. Flash Train This is not an independent unit. It is made up of other SysCAD units such as Flash Tanks and Shell and Tube Heat Exchangers. The Flash Train will attempt to obtain equilibrium across all of the individual units by varying the pressures and temperatures. This functionality is only available in Steady State. Free_Energy_Minimisation (FEM) Modelling combustion and equilibrium using a Gibbs Free Energy Minimization algorithm. Heat Exchanger Used to transfer heat from one stream to another, with no direct contact between streams. Generally the Shell and Tube Heat Exchanger which has more options should be used. Hot Flash Tie This model is used for mixing a very hot stream (hot air) with moist solids to create dryer solids, such as Calciner, Dryer. When the two streams mix, heat is transferred from the hot stream to heat up and flash the moisture in the solids stream, leaving no free moisture in the mixture if the temperature is hot enough. User can switch on the reactions sub model in the unit to perform other reactions in the unit, any sub models will take place after the initial feed mixing and flashing of moisture. Multi-Stage Counter Flow Tie This model is designed to emulate equipment that contacts a Gas stream with either a Liquid or Solid stream in counter-current flow. Shell and Tube Heat Exchanger General purpose heat exchanger. Used to transfer heat from one stream to another, with no direct contact between streams. Requires the user to know the Overall Heat Transfer Coefficient and the heat exchange Area. Can be used as a boiler/evaporator. Can be used as part of a Flash Train. Shell and Tube Heat Exchanger 2 Used to transfer heat from one stream to another, with no direct contact between streams. Requires the user to know the Overall Heat Transfer Coefficient and the heat exchange Area. Allows user defined reactions in the tube side. Can be used as part of a Flash Train. Simple Condenser This is a generic "heat exchanger" model without regards to its cooling media or equipment size. It can provide estimates of the Duty required to condense an amount of material, or alternatively, determine the amount of condensation for a given duty or temperature. This model is only available in SysCAD 9.3 Build 137 and later. Simple Evaporator This is a generic "heat exchanger" model without regards to its heating media or equipment size. It can provide estimates of the Duty required to evaporate an amount of material, or alternatively, determine the amount of evaporation for a given duty or temperature. This model is only available in SysCAD 9.3 Build 137 and later. Simple Heater This is a simplified model of the heat exchanger where only one side is simulated; the other side is reported as duty. Simple Heat Exchanger This is a simple model of a heat exchanger that is used to transfer heat from one stream to another, with no direct contact between streams. Requires the user to set the required temperature for the exiting stream from one side of the unit. The energy to achieve that change is transferred to the stream on the other side of the unit. Steam Turbine The steam turbine converts steam energy into shaft work, which can then be converted to electrical work through the generator. Thermocompressor This is a simple model of a Thermocompressor. It is a form of steam ejector in which a flow of high pressure (HP) primary steam is used to entrain low pressure (LP) secondary steam. The discharge stream is at an intermediate pressure between the high and low pressure steam flows. This model is only available in SysCAD 9.3 Build 137 and later. Evaporator - Potash Achieves vapour liquid equilibrium for a defined set of conditions and allows the user to enable Reactions and/or Solubility to produce salt crystals that can be washed in the Evaporator 'Leg'. Can be used as part of a Flash Train. These models are used to separate one or more feed streams into two or more discharge products. All models are available with a standard Steady State or Dynamic license. Some of these models are designed to handle incoming streams containing liquid and solids only, any vapour present will be lost. This will typically be reported in the unit as a vent. Centrifuge - Batch Centrifuge With the batch centrifuge the user may emulate washing the cake with 1 or 2 washes separately as in a batch process. The user defines the amount of moisture remaining in the centrifuge cake and the amount of solids in the filtrate. Centrifuge - Disk Centrifuge(1) The user defines the amount of moisture remaining in the centrifuge cake and the amount of solids in the filtrate. Electrowinning Cell The user defines the reaction by which the material is deposited onto the cathodes and the cell efficiency. The model calculates the energy requirements of the cell and the amount of heating, based on the enthalpy of reaction and the efficiency. Evaporative Dryer The Evaporative Dryer is used to remove the water from the solids in the feed stream. The model will use the user-defined moisture remaining in the cake to calculate the amount of water to be evaporated off. Any liquid impurities will remain in the cake moisture. The unit also allows for some solids loss with the evaporated moisture. Filter - Belt Filter Simulates a belt filter with any number of counter current wash stages. The user MUST enter data on the simple filtration wash losses, which is often difficult to obtain. Please consider using the Filter Press for most normal filter applications. Filter - Drum Filter Simulates a drum filter with wash water. The user defines the amount of liquid in the filter cake, as well as the fraction of wash water that bypasses through the cake. Filter - Filter Press Used to separate solids and liquids. The user may add a wash water stream. The user defines the amount of moisture in the filter cake, as well as the wash efficiency. Flotation Cell A simple model of a Flotation Cell that requires the user to define the primary species or element that is recovered to the concentrate. The model requires the user to define the primary species or element that is recovered to the concentrate stream. The user may then specify the recovery and grade or mass pull of the primary species/element. The recoveries of secondary species may also be defined by the user. Alternatively, the model can be used with PSD and the user can set the recovery to concentrate of each solid species with a size distribution in each size interval. The user may add an air stream. General Separator Used to split the feed stream(s) into a Vent stream and two user-defined streams. This is a very flexible model using the Solid-Liquid Separator sub-model. Ion Exchange The Ion Exchange model can be used to simulate reactions between a liquor stream and a solid phase of resin. Reverse Osmosis (RO) The Reverse Osmosis model can be used to simulate a reverse osmosis membrane process, often used in water treatment, especially for desalination of sea water. The user may specify the yield and efficiency of the process, as well as the outlet pressure requirements. Solids Recovery Unit The Solids Recovery Unit can be used to model a variety of solid recovery processes including flotation, magnetic separation and spirals. The model requires the user to define the primary species or element that is recovered to the concentrate and middlings streams (if connected). The user may then specify the recovery and grade or mass pull of the primary species/element. The recoveries of secondary species may also be defined by the user. Alternatively, the model can be used with PSD and the user can set the recovery to concentrate/middlings of each solid species with a size distribution in each size interval. This model is only available in SysCAD 9.3 Build 138 and later. Solvent Extraction (Mixer Settler) The Solvent Extraction model may use McCabe-Thiele equilibrium diagrams to determine the extent of transfer between phases, or the user may specify the extent of reaction. The model ensures that mainly aqueous phases leave via the aqueous stream and organic phases leave through the organic stream. Thickener - CC Washer This model is mainly used in the Alumina industry as the user must supply the Scandrett wash efficiency, which is used to calculate the user-defined species concentrations in the under and over flows. The model emulates a thickener with imperfect mixing. Thickener - Classifier The classifier mixes perfectly all the incoming feed streams and then, based on the user configuration, calculates the amount, temperature and composition of material reporting to the underflow and overflow. Thickener - Thickener The thickener model requires the user to define the solid split to the under and over flow in ProBal mode. The user may add Reactions and Makeups to the model, but it assumes 100% mixing efficiency. Thickener2 The Thickener 2 model is mainly used in the Dynamic mode to separate solids from the liquids in the feed stream. The unit can be configured to have surge, allowing the user to set the underflow rate. Alternatively, the model can calculate the required underflow rate to give the user defined underflow solids fraction. The user may add Reactions, Makeups, EHX and Evaporation to the model. Thickener - Underflow Washer This model has the functionality to 'wash' the underflow stream of the thickener. The user may set the wash efficiency and enable Reactions and Solubility in the main section of the model and the Over and Under flow sections. Only available in SysCAD 9.3 Build 137 and later. Thickener - Washer(1) This is the same as the thickener model, except that it also allows the user to set the mixing efficiency between the washer feed and side streams. Thickener - Washers (CCD) This single model simulates an entire CCD circuit. It can be used to quickly determine the concentration in the final over and under flow streams from a series of thickeners. The model is designed to be used as a quick means of determining the effect of differing numbers of stages or wash water ratio in a CCD circuit. There are a number of other general models that may be used in a project. All models are available with a standard Steady State or Dynamic license. Makeup Source A source of material, used together with a Makeup Block (MU) to add material directly to a unit. Discard Sink A destination of material, used together with a Discard Block (DB) to remove material directly from a unit. This model is only available in SysCAD 9.3 Build 138 or later. DirectLink The DirectLink is similar to a pipe and is used to transfer material between special types of units. Area Model Used in dynamic to represent an area. Material may flow to an area. Unit models will belong to an area model. There are a number of models in SysCAD that are used for process control purposes. The following 3 models are the most common Control models used in both Dynamic and Steady State projects and are available with a standard license. General Controller (PGM) Used to simulate plant control functions and to perform user-defined calculations. This model uses a defined programming convention and allows the users to implement loops, comparison operations, counters, etc. PID Controller Used to simulate PID controls in the model. This may be used in both dynamic and steady state models. Set Tag Controller Used for ratio control or setting multiple tags with a common value. The following Control models are also used for process control purposes and are available with a standard license. The PID, Transmitter, Actuator and Control Link can be used together as described in 'Using PID, Actuator and Transmitter'. Get Tag List Used to generate a list of values from SysCAD in an external file, often an Excel report. Set Tag List Used to set predefined values from external sources, usually Excel, into a SysCAD model. Slew Rate Controller Used to gradually change a process variable to a setpoint. This model is only available in SysCAD 9.3 Build 137 or later. Task Used to execute commands / tasks at scheduled times. Downtime Used to simulate downtime of a piece of equipment due to a regular event (such as maintenance) and/or failure or other causes. Events Used to read in timed process variable changes. Data is presented in a table with single variable change against a single time column. Events do not need to be sorted by time. Noise Allows the user to add disturbance to a dynamic model. Waveform Controller Allows the user to add waveform type of variation to process variables. Profile The profile model reads a data file of numbers for increasing times into the model. This is used in dynamic models to adjust variables with time, such as reliability data for equipment, rainfall figures for a year, etc. Queue Profile Used to read in process variable changes based on a trigger command. Scheduled Events Can be used to simulate periodic events in a plant model, such as Batch Addition, Reagent dosing, Batch Filtration, etc. The model allows a tag to be set to one of two values depending on whether the unit is active or inactive due to a scheduled event. All statistical models are available with a standard Dynamic license. Bivariate Statistics Calculates and displays statistics for two variables and their correlation. General Statistics Allows the user to collect statistical information for selected variables for a dynamic simulation, e.g tank levels, flows through pipes, etc. Single Variable Histogram Calculates and displays statistics for a single variable. These models are used in projects that contain and require the tracking and manipulation of particle size data (PSD). The models manipulate the material based on the size distribution information. All models are available with a Steady State or Dynamic license. All models require the Size Distribution add-on and some require an additional add-on as shown in the table below. Stream Results Submodel used in a number of different size distribution models to display common stream properties and PSD information for feed and product streams. Crusher This model will be replaced by the Crusher2 model. User should change the model to the Crusher2. Various Selection/Breakage methods for a number of correlations with user supplied parameters. The method supports optional internal classification in various closed circuit configurations. Define typical feed and product size distribution (Test Data) which is then used to calculate extents of breakage. Simple Pass Through method, product = feed (non-PSD). Cyclone This model will be replaced by the Hydrocyclone model. User should change the model to the hydrocyclone. Mill The Mill may be based upon a user defined product discharge partition curve, a user defined selection / breakage function or a user defined feed and product size distribution based on testwork. The model uses these size distributions to calculate the extents of breakage. The unit will calculate the power required based on the product size and the bond work index of the material. Screen Discontinued. This model has been replaced by Screen 2 since SysCAD 9.2 Build 135. User should change the model to the Screen2 model. Sieve Changing module This module is used to change from one sieve size to another. The following sub-model/model does NOT require PSD to operate, but does contain PSD as an optional method. Solid-Liquid Separator The Solid-Liquid Separator sub-model is used in the General Separator, Evaporator and Precipitation3 models. It allows splits between two outlets based on size data. See Solid Separation for more information. Precipitator3 The precipitator 3 model is used in the Alumina industry. The full PSD model implements growth, agglomeration and nucleation mechanisms. Please see Alumina3 Precip - Full PSD for more information. In addition, the model also includes a Classification option, where user can set up the optional Solid-Liquid Separator to specify the outputs based on size data. Flotation Cell User can specify the recovery based on size data. See Recovery for more information. Solids Recovery Unit User can specify the recovery based on size data. Size recovery can be applied to the concentrate and/or the middling stream. See Recovery for more information. In SysCAD Steady State the stream pressure are usually managed by setting the operating pressures in some of the unit models. However the valve and pump models are also used for setting pressure drops and boosts, especially in vapour lines. All models are available with a standard license. Compressor Gas compressor used to increase the pressure of gas streams. Gas Pump Used in dynamic projects with Transfer mode and in Steady State projects. It serves as a simple pressure boost model. Non return valve Used in dynamic projects with Transfer mode and in Steady State projects. It serves as a simple pressure drop model. In this mode, the flow through the pump is specified in the upstream pipe or in the feeder connected to the pump. Pressure Exchanger Used to model energy recovery devices such as those used in reverse osmosis plants to recover energy from high pressure brine streams. The pressure energy in a high pressure feed is transferred to a low pressure stream, thus acting like a pump for the low pressure stream, increasing its pressure. This model is only available in SysCAD 9.3 Build 137 or later. Pump 1 Used in dynamic projects with Transfer mode and in Steady State projects. It serves as a simple pressure boost model. In this mode, the flow through the pump is specified in the upstream pipe or in the feeder connected to the pump. Pump 2 Used in dynamic projects with Transfer mode and in Steady State projects. It allows users to set the pump speed or the pressure boost. The pump will NOT control the flow, but the user can use the pressure boost results to set the flow through the piping system. Reducer Used to change to a smaller pipe size. In steady state projects, it serves as a pressure-changing model. Valve 1 Used in dynamic projects with Transfer mode and in Steady State projects. It serves as a simple pressure drop model. In this mode, the flow through the valve is specified in the upstream pipe or in the feeder connected to the valve. Valve 2 Used in dynamic projects with Transfer mode and in Steady State projects. It allows users to set the valve opening and calculates the pressure drop due to flow. The valve will NOT control the flow, but the user can use the pressure drop results to set the flow through the piping system. Pump 1 - Dynamic Transfer Pull Used in dynamic projects with Transfer Pull Flow Calculation mode. It allows the user to set pump capacity and speed. In this mode, the maximum flow through the pump can be specified inside the pump model. Piping System Model Mainly used in dynamic projects with Transfer mode. It consists of a number of sub-units, which together comprise a 'Piping System'. The user specifies which sub-units will comprise the piping system and configures them so that they comprise the total piping system. The piping system model then calculates the pressure drop across each sub-unit and hence across the entire system. This model is only available in SysCAD 9.2 Build 133 or later. These are dynamic only models used for material handling. When these models are in use, the pipes connected to the unit operation will operate in transfer mode. All models are available with a standard Dynamic license. Conveyor Belt A model with surge capacity, speed and a number of take-off and feed points as well as drives with moving positions. The material on this unit moves along the belt in discrete packages, to emulate a true belt conveyor. Multi-Storage A model for multiple parallel bins or stockpiles. Tailings Dam A model for a dam with two layers, a solids bed and a clarified liquor layer. There is a range of different sub-models included in SysCAD. These sub-models are available in many different unit operations models. Depending on the individual unit operation model, some of the sub-models are available as options that may be switched on or off by the user and other sub-models are included automatically. Once a sub-model has been enabled, the access window for that sub-model becomes visible on a tab in the main unit operation's access window. The sub-models generally need to be configured for the desired behavior via the access window. Note that not all sub-models are available in all unit operations. Many of the Sub-Models are available through Evaluation Blocks which provide an easy way to control which sub-models are enabled and in what order they are evaluated. Discard Block (DB) This sub-model is only available in SysCAD 9.3 Build 138 or later. Similar to makeup block, this gives the user a number of flexible controlled methods to remove material from the model to a Discard Sink without connecting and configuring a normal stream. Environmental Heat Exchange (EHX) This allows the user to enable heat transfer between the environment and the unit operation. There are a number of different options for specifying heat exchange with the environment. Evaporation Block (Evap) It allows the user to specify evaporation from the unit via a number of methods. Heat Exchanger (HX) This allows a heat exchange between a stream and the contents of a tank. General Model (GM) or Split Flows (Split) This gives the user a large amount of flexibility in determining the flow of material from the unit. The user may split the flow between two or more exiting streams based on percentage of total flow, phase, species, or any combination. General Model Thermal (GMT) This gives the user the flexibility to specify outlet stream temperatures, if they need to be different. The overall heat is conserved. Makeup Block (MU) This gives the user a number of flexible controlled methods to add material to the model from a Makeup Source without connecting and configuring a normal stream. Reaction Block (RB) The reaction block allows the user to add reactions to most of the main models. The user creates a text file containing the reactions using the designated reaction editor. The reactions are then read into the model. Solid-Liquid Separator The Solid-Liquid Separator block allows the user specify the solid/liquid split between 2 outlet streams. This sub-model allows the user flexibility when setting the splits. Vapour Liquid Equilibrium (VLE) This allows the user to select the vapour: liquid equilibrium behaviour of the material in the unit. There are many tab pages or groups of tags that are common to all or many models. Common Data Sections General sections on first and Info tab pages for all models. 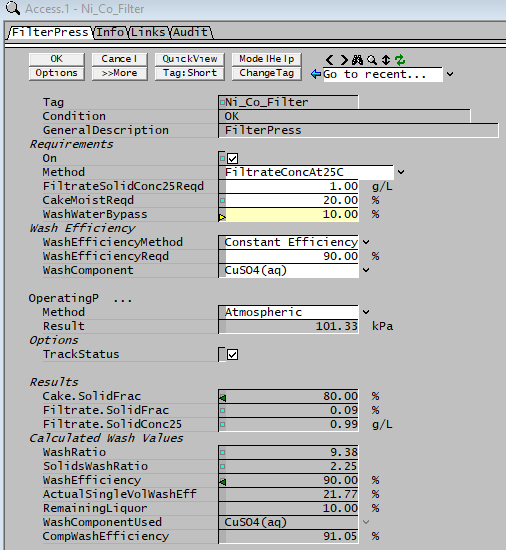 Common Content Section Component make-up of material flow (eq massflow) usually for setting of flow and makeup in models such as Feeders and Makeup Sources. Material Content Section Component make-up of material content, e.g. mass, usually for dynamic units with surge. Material Flow Section Component make-up of material flow (eq massflow) usually for pipes, flow in or out of model, etc. Links Table Summary tables for all the input and output links. Audit Summary of mass and energy balance (inputs/outputs) of a model. There are a number of system "models" that are used in a project. Quality Models are used to further define stream data or a species model for use in stream or unit operations. These are usually optionally created for different sections of the flowsheet. See Qualities Models for a general description of how to use qualities models. All models are available with a Steady State or Dynamic license. Some models require an additional add-on as shown in the table below. LockUp The user may hide a percentage of one or more species from any reactions in the flowsheet. For example, in a gold plant, there may be 10% of the gold that cannot be recovered. This could be Locked up by the user and will never be recovered in the model. Material Tracking This option is used to 'track' one or more species in a project, e.g. if the user has different feed sources to a plant, they can track these sources and SysCAD will then show how much of each product is attributable to each source of material. Specific Surface Area (SSA) Single value representation of size distribution. Commonly used in precipitation in Alumina models. The species model selected by the user determines all properties of the streams or unit contents within a flowsheet. Examples of properties are Density, Specific Heat, etc. The default species model to be used is defined in the project configuration file. Normally this is the Standard Species Model whose properties or generally based on the Mass Weighted Mean of the components. The properties of the individual species are taken from the species database (SysCAD.mdb). This database is compiled by the user and must be checked to ensure data used are correct. For help on the entering and modifying data in the SysCAD.mdb file, please see Species Table. In addition to the Standard species model, which is available to all SysCAD users, other client specific species models may be developed for a specific project or client. For example, in the Aluminium industry, the generic Bayer properties model is adapted for specific refineries. Changing Species Models describes how a species model is selected. All models are available with a Steady State or Dynamic license with the appropriate add-on as shown in the table below. Standard This is the default species model used by SysCAD. Most physical and thermodynamic properties are calculated on a simple mass weighted mean basis. Alumina models are available with a Steady State or Dynamic license with the Alumina add-on. These models are developed especially for the use in the Alumina industry and must be used with a Bayer Stream Properties model. Alumina 3 Bayer Species Model Calculates the properties of the streams based on Bayer3 liquor properties. Uses NaAl[OH]4(aq) as Aluminate; Al[OH]3(s) as Gibbsite; AlO.OH(s) as Boehmite and Na2SiO3(aq) as dissolved sillica. Alumina 3 Bayer Equations Lists the equations used by the Alumina 3 Bayer Species Model. Precipitation 3 Model The model is for use in the alumina industry only. NOTE that this model requires NaAl[OH]4(aq) as Aluminate and Al[OH]3(s) as Gibbsite, therefore requires Bayer3 Species Model. In SysCAD 9.3, operates in Dynamic with additional functionality. General Bayer Data General information about the alumina Bayer properties models. Used in the alumina industry only. Heat of Dissolution of Gibbsite and Boehmite The Heat of Dissolution of Gibbsite and Boehmite in Bayer Liquors in SysCAD reactions. Detailed papers on the Heat of Dissolution of Gibbsite and the Heat of Dissolution of Boehmite can be downloaded from http://www.syscad.net/downloads. The following topics relate to the Alumina 1 models, please note that Alumina 1 has been discontinued in SysCAD 9.3, please consider changing to Alumina 3. Alumina1 Vs Alumina3 Comparing the differences between the two Alumina Property Models. Converting Alumina 1 Project to Alumina3 Example work flow for converting an existing Alumina 1 project to Alumina 3. Alumina 1 Bayer Species Model Calculates the properties of the streams based on Bayer liquor properties. Uses Al2O3(aq) as dissolved Alumina; Al2O3.3H2O(s) as Gibbsite; Al2O3.H2O(s) as Boehmite and SiO2(aq) as dissolved sillica. Discontinued in SysCAD 9.3. Precipitation 1 Model The model is for use in the alumina industry only. NOTE that this model requires Al2O3(aq) as Alumina and Al2O3.3H2O(s) as Gibbsite, therefore requires Bayer1 Species Model. NOTE this model is NOT compatible with Bayer3 species model. Discontinued in SysCAD 9.3. Potash models are available with a Steady State or Dynamic license with the Potash add-on. These models are developed especially for the use in the MOP (Muriate of Potash) industry and must be used with a Potash Stream Properties model. Potash Species Model Calculates the properties of the streams based on potash liquor properties. Potash Solubility The implemented Potash Solubility information are documented here. Potash Evaporator Achieves vapour liquid equilibrium for a defined set of conditions and allows the user to enable Reactions and/or Solubility to produce salt crystals that can be washed in the Evaporator 'Leg'. Can be used as part of a Flash Train. Sugar models are available with a Steady State or Dynamic license with the Sugar add-on. These models are developed especially for the use in the Sugar industry and must be used with a Sugar Stream Properties model. Sugar Species Model Calculates the properties of the streams based on sugar liquor properties. Sugar Cane Shredder The sugar Cane Shredder is used to prepare sugar cane by opening plant cells to allow the release of juice before it goes to the crushing operations. Sugar Crusher This model is used to squeeze and separate juice from a shredded cane feed. The model is for use in the sugar industry only. Sugar Crystalliser The sugar crystallizer is used to precipitate aqueous sugar from molasses onto existing sugar crystals. Sugar Dryer The sugar dryer is a counterflow dryer used to cool and dry sugar crystals in the final stage of processing. Sugar Fugal This model is used to centrifuge and wash sucrose crystal. The model is for use in the sugar industry only. Sugar Juice Screen The sugar juice screen is used to separate mud solids and fibre from juice expressed during crushing operations. Sugar Mud Filter The mud filter is used to wash juice from mud solids before it leaves the process. Sugar Vacuum Pan The sugar vacuum pan is used to precipitate aqueous sugar onto existing sugar crystals in a continuous operation (as opposed to batch operation). Falling Film Evaporator 3 The Falling Film Evaporator 3 (FFE3) unit operation is used to model evaporation of water from juice. The model works for both falling and rising film evaporators (such as a Roberts evaporator). OLI models are available with a Steady State or Dynamic license with the SysCAD OLI add-on. An appropriate OLI license from OLI Systems (olisystems.com) is required. OLI in SysCAD is not implemented as a Species Properties Model but as a unit model for use at appropriate locations in a plant model. These models use OLI Systems leading Electrolyte Simulation Software to predicate equilibrium conditions and properties (such as pH) for aqueous chemistry. OLI Chemistry Model Define and view various options for the selected OLI chemistry model, including management of mapping of SysCAD species list to species list used in OLI. OLI Sample Model Stand alone unit model to perform side calculations using OLI for predicting aqueous chemistry equilibrium conditions and properties including pH. OLI Reactor Flexible general purpose unit model using OLI software to calculate product stream composition and properties based on user options and feed. Functionality is similar to SysCAD Reaction Block and FEM where for a given feed, reactions occur with optional heat exchange. Seawater Species Model Accurate seawater thermophysical properties. Variables those are required to define the model. FiltrateSolidFracReqd / FiltrateSolidConc25Reqd, CakeMoistReqd and WashBypass. The Drum filter model uses these settings to calculate the material split from the unit. Variables with a yellow background means the variable is being set by a controller. See Access Field Reference Tag Status Colour for more information. Variables those are calculated by the model. These variables are displayed on a grey background and cannot be changed by the user. In the access window below, the model calculates Cake.SolidFrac and Filtrate.SolidFrac and so on. The user can view each of these sections by clicking on their respective tab at the top of the page. The variables for that section can then be accessed. This briefly outlines the purpose of the unit and how it operates within a flowsheet. This shows the default drawing of the unit with the appropriate stream connected to the unit. This section lists all the streams that can be connected to the unit. It also gives the essential connections, without which the unit cannot operate, and the number of streams that can be connected to each connection. The method by which the unit calculates the material split. Any equations used to define the unit are given in this section. This attempts to quantify the variables for each unit-s access window. This page was last edited on 8 April 2019, at 02:10.